The Importance of Utilizing Matterport 3D Scanning! One of the reasons to choose The Group Real Estate as your preferred realtor service is not only the amazing Realtors we have at your beckon call, but the technological advances that we have at our disposal to help you sell your home faster. One of these tools is the Matterport. You may be asking yourself, “What is the Matterport?” Sounds like a ride from Disneyland. Imagine, if you will, presenting an “open house” feel of your home without having to open the doors of your home right away. The Matterport idea lets you have this “open house” feel always! The Matterport is a Three-Dimensional tour using a 360-degree scan with a camera. A Matterport camera sits on a tripod and rotates 360-dgrees scanning a room and collecting data that is used in the 3-D display. It may take a few sweeps of an area to collect all the data needed, but once the data is fully collected, you are able to upload the data to the cloud on the Matterport. The cloud is where the data is organized, and once done, creates a 3D tour of the home. One of the many advantages of garnering a Matterport scan is that it can be shared on any device through your existing marketing channels. Buyers of the property can experience the feeling of being right there, inside the home, as they click through the tour on whatever device they are using (ie. cell phone, tablet or laptop). If you do have access to Samsung Gear VR, Oculus or Google cardboard, you can also go through the 3D tour this route, giving it a much more immersive feel. The main benefit to getting a Matterport scan of your home is it allows the buyer to get a quick walk-through of your home. In a day and age riddled with technological advances and the love of all things technology, this puts your home up for sale one notch higher than any other way of selling your home. There is always added value to a personal touch and an in-person valuation of your home. However, in a fast-paced environment a quicker way to get viewers to be “inside your home”, the Matterport scan is the perfect route. There are multiple angles, facets, and features to the Matterport that allow you to place extra pictures, information and details as your viewers take the walk-through. Utilizing the Matterport will help you sell your home faster than any other method. The reason being is this gives potential buyers, directly to their fingertips, a walk-through of your home, highlighting each and every piece of your home that benefits you selling it. The Matterport offers a security blanket in today’s world, as well. This lets more “foot traffic” travel your home without letting people into the home. It also can help weed out serious buyers and those who just want to casually look at homes. As you get more hits on your Matterport scan, they are more often true buyers who will contact you with the possibility of an “in home” walk through of your home. If the potential buyer is worried about the needs of the home, this is the perfect way for them to find out before having to leave the comforts of their own home to see if the listing is worth their time. On the flip side, this helps the Realtor, as well. If they are showcasing true pride in the listing that they oversee, they will want to send you the link to the virtual scan they took. It garnered 108 impressions, 88 visits, and 62 unique visitors. Due to the strength of this Matterport (and drone video – more on this in another blog), the home sold in under 5 days! 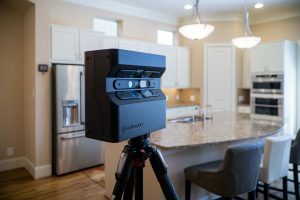 This highlights the strength of moving forward in Real Estate with a higher-powered tool such as the Matterport. -35% of potential buyers are Millennials are new home buyers and in the next 2 years, 80% of Millennials will seek to purchase a home. -89% of buyers across demographics increasingly look to web and mobile tools to narrow down their lists of properties to consider. -Real estate listings with more visual content (like video) receive 403% more inquiries compared to those without. -41% of home buyers found interactive maps very useful, while 40% felt the same about virtual tools. -92% of home buyers search the internet before contacting an agent. According to Apartments.com, visitors to their site spent 3x to 6x more time engaging with property listing that offer a Matterport and immersive 3D experience. Properties with Matterport tours receive 49% more qualified leads. According to Redfin, Homes sell an average of 10 days faster and for $50 to $100 more than comparable homes thanks to Matterport 3D walk-throughs, advanced technology and great customer service. In a survey conducted through Matterport.com, 90% of agents stated that Matterport helps them build a stronger brand in the marketplace, 83% are more competitive because of Matterport, and 74% win more listings because of Matterport. As stated before, the power in technology will do nothing but help you. And numbers speak for themselves. Do yourself a favor, look up one of our wonderful agents here at The Group Real Estate, ask them about Matterport and how they can better suit your selling needs by showcasing a beautiful rendering of your home on the cloud at Matterport.com.